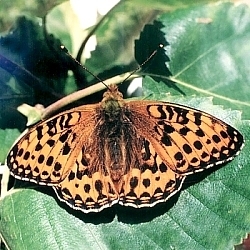 Habitat: The main habitat of the Dark Green Fritillary is coastal sand dunes and rough open hillsides inland. Larval Food Plant: Violets Viola spp. Hibernation: Overwinter as a larva. This butterfly is a fast flier. 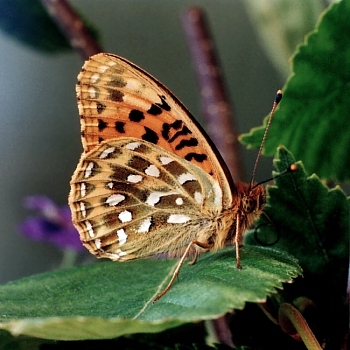 It may be distinguished from the Silver-washed Fritillary by the convex outer margins of the forewings and by the dark apple-green colour and silvery spots on the underside of the hindwings. This conical shaped egg measuring c.1.0 mm tall is yellow when first laid and develops purple bands in time. It is deposited near to, or on, violet plants in sheltered places in July and August, hatching in c.20 days. along each side below the level of the spiracles. Shiny black head. 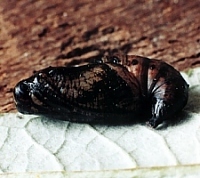 The newly hatched larva after eating its eggshell immediately goes into hibernation. late May. 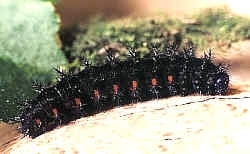 This larval stage lasts from August to May or June. suspended in a loosely constructed tent-like structure of spun leaves low down among vegetation. 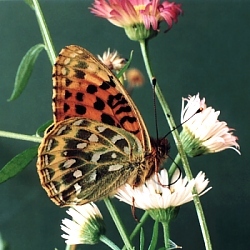 feeding, mating and ovipositing takes place.